Conifer Property Services Ltd has made every effort to make this site as accessible as possible. If you wish to improve the accessibility of the site further please click Accessibility version link on the menu. Oh Dampnation! Here comes the Damp Proofing Blog! Conifer specify only the best quality materials for our customers. Most commonly used in modern basement conversions and stone barn conversions is the Oldroyd Cavity Drain Membrane System. This type of system is also known as Type C Structural Waterproofing. Using a variety of specially engineered polypropylene membranes with Oldroyd, self sealing brick and plaster plugs and tapes we can turn a damp, smelly, underground room or an old musty barn into a warm, modern living space. There are a range of cavity drain membranes available, so the right product can be tailored to individual jobs. Cavity drain membranes can be used in conjunction with drainage channels (such as the Oldroyd Aquadrain Channel) and sump-and-pump systems such as the Sentry sump system in basements or cellar situations. Cavity drainage systems are suitable for damp proofing walls, floors and even vaulted ceilings if applied correctly. They can be applied in a variety of situations, not just for waterproofing or tanking basements. Many barn conversions, bank houses, renovation and even new-build projects can benefit greatly from membrane damp proofing. The multi-layer technology of Oldroyd's cavity drain systems results in increased membrane strength and a lack of bending or warping which can sometimes be found in other cavity drain membranes. Many of the membranes in the range are also made with 49-70% recycled plastic, giving some peace of mind for the environmentally concerned. The picture above shows a combination of Oldroyd Xp Plaster Membrane and Oldroyd Xv Clear Membrane - on this project some of the wall was to be covered with insulated stud-work and other areas were to be plastered directly to save space. 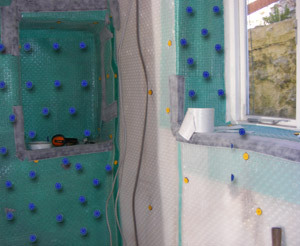 We offer a complimentary advice service on selecting the appropriate cavity drain membrane system for your property, and provide full specifications for cavity drain membrane systems in basements and barn conversions, renovation work and damp proofing for stone walls or solid wall (non-cavity) construction across the Chester, Cheshire, Shrewsbury, Telford, Oswestry, Shropshire, Welshpool, Wrexham, Clwyd, Powys, Gwynedd, Aberystwyth, Ceredigion, Mid Wales and North Wales areas. Membranes are flexible and will not crack or leak during the seasonal movement usually found in old buildings. If a traditional, waterproof render cracks water will find a way through to the plaster again and cause damp issues.